The 1915 Lincoln Highway Guidebook doesn’t list Church Buttes; the first time Church Buttes is mentioned is the 1918 guide book; it states that this is 425 miles from the Nebraska-Wyoming border. In addition to the Palisades near Green River, these natural buttes stand alone on the eastern edge of the Unita County line. Seeing these buttes for the first time is an affirmation as to why American painter Thomas Moran loved working in Wyoming. The view below is from the north side of Church Buttes. The new image, (color) is from the south side. This view of Church Butte would have welcomed and inspired awe in travelers going east from Lyman. Blacks Fork River is a tributary of the Green River; this is one of two steel girder bridges that span the river. Both were placed in about 1928; today the first alignment of the Lincoln Highway is a county road serving the needs of ranchers, sportsmen and oil field workers. 1915 LHA: New York: 2343 miles, San Francisco: 1041 miles Population 800. Uinta County. Two hotels, accommodations for 50. Marshall, $1.00; Lyman, 50c. Route marked through town and county. Three general business places, telephone, Gas, 30c. Oil. One newspaper, 2 public schools, 5 automobiles owned. Camp site. Mormon settlement. John’s Bar was opened in 1952 and became the first establishment in Lyman to serve liquor. The unique windows came from a defunct bar in Mexico; these were originally made of plate glass. Today they are made of plexiglass. “Jim Bridger, realizing that the need for a stopping place, established this log trading post and blacksmith shop in 1843. It was then in Mexican territory. Bridger was one of America’s greatest frontiersmen and scouts; he said he came when Laramie Peak was a hole in the ground. Fort Bridger was taken and improved by the Mormons in 1853 (Jim Bridger claims he never sold it), then burned by them when they were fleeing from Johnson’s United States Army in 1857; later that year it was reconstructed by the United States Army and remained a military post until 1878. It was a Pony Express station in 1860. “Cliff Robinson and Oscar Dahlquist in front of tourist cabins at [the] entrance of Fort Bridger” Wyoming State Archives, Department of State Parks and Cultural Resources. 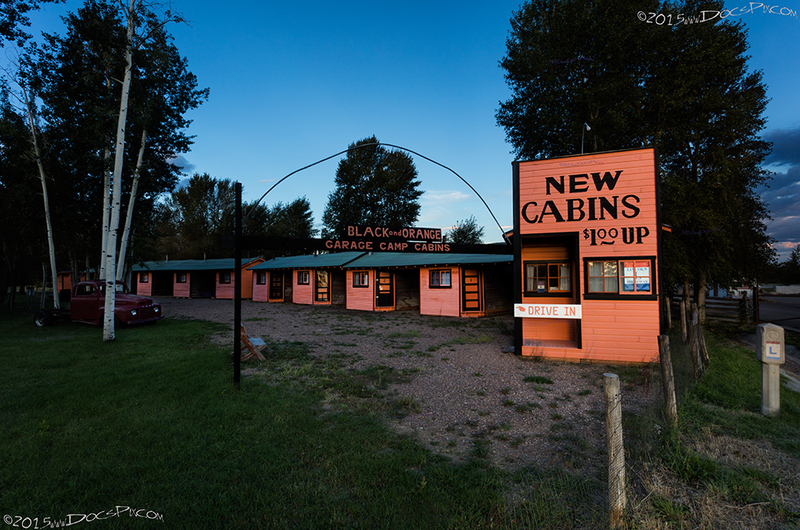 The Black and Orange Motel was restored in 2009. Today they are a part of the historic Ft. Bridger site. About six miles south of the original (1913) alignment of the Lincoln Highway is the ghost town of Piedmont. A man named Moses Byrne built at least five kilns with the intention of producing charcoal, for use in ore smelters in Salt Lake City, Utah. According to one of the placards at the site, each kiln was loaded with approximately 30 cords of pine trees. These would then be fired – not burning – but smoldering. This would proceed for six to eight days, the wood would then be cooled for another five days. After which it would be loaded onto rail cars for transport. The process would produce about 25 bushels of charcoal for every 100 bushels of timber. Charcoal was favored over wood in the smelters because the temperatures required would routinely exceed 2000 degrees Fahrenheit. It is reported that at the height of production in 1873, the kilns were yielding over 100,000 bushels of charcoal every month. The kilns ceased production sometime by the turn of the century as an alternative, coke, was found to be just as suitable for smelting and blacksmith needs. The placards indicate that Union Pacific rerouted the rail line to the north sometime in the early 1900’s, and thus left Moses Byrne no economical means of getting his product to market. 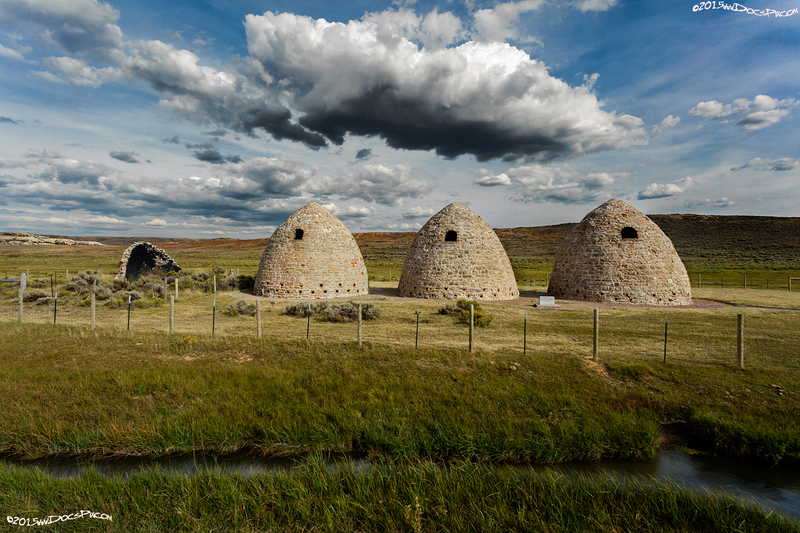 Three of the five charcoal kilns at the former town of Piedmont, WY. 1: http://quod.lib.umich.edu/l/linchigh/x-lhc1057/lhc1057. University of Michigan Library Digital Collections. Accessed: October 25, 2015. 2: Book: Federal Writers Project (1941), Wyoming: A Guide to Its History, Highways, and People, American Guide series, North American Book Dist LLC, p. 261. 3: “The Complete Official Road Guide of the Lincoln Highway”, (published by The Lincoln Highway Association, National Headquarters, Detroit, Michigan – copyrighted 1915), Box 98, Folder Number 1, Payson W. Spaulding papers, 1886-1980, Collection Number 01803, American Heritage Center, University of Wyoming. 4: Book: Wyoming Place Names, Pg. 127, 2004 Ed. Mae Urbanek, Mountain Press Publishing Company, Missoula, MT. 5: Book: Wyoming Place Names, Pgs. 68-69, 2004 Ed. Mae Urbanek, Mountain Press Publishing Company, Missoula, MT. 8: Book: Wyoming Place Names, Pg. 155, 2004 Ed. Mae Urbanek, Mountain Press Publishing Company, Missoula, MT.